Has your air conditioning unit abandoned you when you need it most? 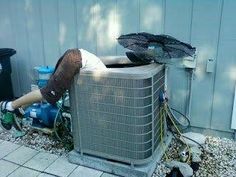 Every homeowner or business owner dreads their air conditioner going kerplunk in the hottest of summer months. Ace Contractors handles both routine maintenance and offers 24-hour emergency service as well. You can always count on us to be there when you need us. Visited a neighbor or relative only to be blown away by their new and improved tankless water heater? Since Ace Contractors are plumbing experts, too, we can install the new tankless water heater for you. Whether you are interested in purchasing and installing a new unit or simply getting regular maintenance to your existing unit, we have got your covered. More than 250,000 customers are satisfied with our work. Heating down when its chilly outside? Our trained staff is standing by the phones waiting for your call around the clock—24 hours a day, 7 days a week. We can answer any questions you may have about your heater or furnace or send a team out to handle an urgent matter right away. Not other team of plumbing and HVAC contractors is quite as fast and friendly as Ace Contractors! Call us now for quality service when you need it the most!